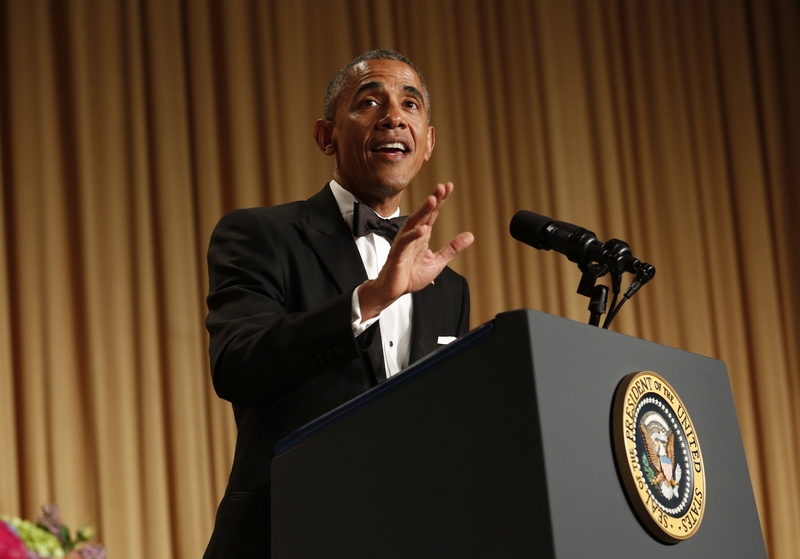 Saturday's White House Correspondents' Dinner delivered a plethora of memorable moments, with featured entertainer Larry Wilmore and President Barack Obama dishing out edgy jokes at the expense of politicians of all stripes as well as several prominent members of the media. Saturday was Obama's last time on the stage at the prestigious annual event, and he did not disappoint. One of the highlights of the evening was Obama's pre-recorded video, called "Couch Commander," in which the president tries to figure out what his life will be like after stepping down as Commander-in-Chief. Below, let's take a look at some of the best moments in the "Couch Commander" White House Correspondents' Dinner video. Throughout the video, Obama consults with Vice President Joe Biden and former Republican Representative John Boehner to answer the question of how he'll spend his time living in Washington, D.C., for two years after leaving the White House. The video features Obama traversing a number of seemingly mundane scenarios, like going to the DMV and eating popcorn with Boehner, in search of an answer to his existential quandary. These were some of the most memorable moments brought to us courtesy of "Couch Commander." Joe Biden's got a real dilemma on his hands: Which pair of sunglasses should he wear? Obama points out that the glasses are the same, and he needs his right hand man to focus up on the president's big question. Biden proceeds to mumble undecipherable complaints, mocking the president's refusal to take the veep's dilemma seriously. Obama calls him out: "I'm sorry, what was that?" Biden quickly collects himself, saying, "I said, Mr. President, you have to be practical!" One of the things Obama resolves to do as Couch Commander is to start driving again, so he needs to renew his license. His visit to the DMV, like many of ours, didn't quite go smoothly. The trouble begins when the clerk asks the president for his name, and he gives her his full name: "Barack Hussein Obama." The clerk responds, "Yikes!" Then she asks for the birth certificate, and just like the birthers, questions its authenticity. When Obama stumbles across Michelle's phone and sees Snapchat on it, he has a fun idea: Why not create an advertisement promoting Obamacare? Only Michelle's Snapchat has a filter on it that turns the user into a frightening, demon-like character. His attempt looks more like an attack ad than anything else. Boehner shows up in the video after Michelle tells Barack that he should talk to someone who's been in his position about what to do next. Boehner resigned from Congress toward the end of 2015 after falling out of favor with many fellow Republicans. Throughout the encounter, Boehner encourages Obama to be himself and relax, even offering the famed former smoker a cigarette. Obama is so thrilled that he'll get to wear his "mom jeans" again. The video ends with a look into the future, when Obama is free to do as he pleases during his post-presidency. Wolf Blitzer reports that Obama is on his 347th golf game of the year. And nobody cares.